“How much life insurance do I need?” is a question we are asked often. Just about everyone needs life insurance. Unfortunately many go without and many more don’t have enough. You need life insurance if someone else will be affected financially by your death. There are multiple formulas for figuring out how much to buy. By doing a little research someone may get inundated and frustrated with information and tools to use when trying to figure out how much life insurance to purchase. There are multiple life insurance calculators and broker questionnaires that take into account debt, college for kids, cost of living increases, among others. In addition to protecting those you love, certain kinds of life insurance are bought as an investment tool. Typically individual life insurance is purchased with after tax dollars therefore money you received from the policy is done so tax free. There are many types of life insurance. There’s Term Life, Whole Life, Universal Life, Indexed Universal Life, Final Expense Insurance, and more. They all are bought for different reasons but they all do the same (single) thing. They protect your dependents from losing the income you generate. A good place to start and a simple way to calculate how much you’re worth is by looking at how much you make. You start with how much money you earn annually and multiply that by how many years you have left to work. Let’s say you’re 50 years old, you make $50,000 per year and you plan to retire at 65. The death benefit of your life insurance policy should be at least $750,000. Your “monetary” value to the people that depend on your income is what you are insuring. Simply put… By purchasing life insurance you are replacing your ability to generate income if you aren’t around anymore. It’s very important to protect the security your dependents have by way of your income. Imagine you have a machine in a room of your house that prints money and it prints $50,000 per year. You would surely lock it up to keep it safe, clean it and oil its parts. You would do your best to make sure no harm comes to it. You may even go so far as to buy a warranty to insure this machine in the event of a malfunction or needing a replacement. With all the preventive measures you take to keep that machine going you certainly wouldn’t want it getting seriously sick into a car and driving to work every day on the Maine winter roads. You probably wouldn’t be eager to let it climb a ladder to do some roof repair or go boating on Sebago. But if you did have to let this money making machine go do all these things you would look to find a way to protect the income that machine makes for you year after year. You have a lifestyle, bills to pay and future plans that depend on the income your machine generates. You too are a money making machine and if others depend on that income to pay the bills and continue with the plans that were made there’s an easy way to protect them. Graden Joly is The Windham Eagle student of the week. 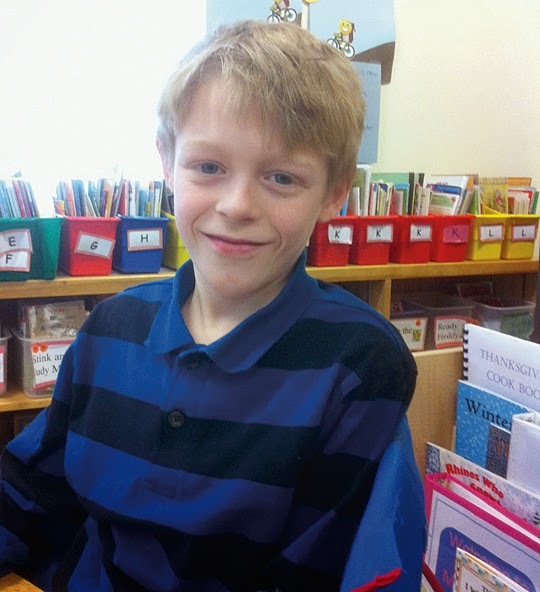 This 8-year-old attends Windham Primary School and is in the second grade with Rebecca Miller and Jacqueline McDermott. Joly lives with his mom and dad and sister, Grace, who’s in first grade. They have a cat named Scout. In addition to being a spy, Joly would also like to go to college to do art, he said. “Graden always works so hard and challenges himself to do his very best. He is a great role model for other students in our class. He is always someone I can count on to do the right thing and not give up,” said Miller. Hobbies: I like to play the Wii, make forts in the basement with my sister, and play with my cat. Memorial Day can mean many things to many people. To some people it is a chance for a spring vacation, with perhaps a family trip somewhere. To other people it can mean a chance to have a quiet time at home and to start those spring clean-up chores and garden work. The students, those in high school or in college, are all looking at the calendar and thinking of “finals” and perhaps a graduation ceremony. Most communities are planning some sort of a Memorial Day ceremony to honor the military Veterans that live in their respective areas. These ceremonies can be simple or extensive, depending upon the community’s efforts, their available resources, and their intentions. At these ceremonies many of the attendees are Veterans, those men and women who have served a portion of their respective lives in the military services of the United States. They will be attending these ceremonies, to remember, and fill that need to remind themselves of what they have done at some point in their lives. Of being “out there on the line”, placing themselves in danger to save someone else's life. They will also be remembering other members of that special brotherhood, who paid the ultimate price and lost their lives, while saving others. When you encounter these Veterans, thank them and take a moment to look into their eyes. You may be met with the “thousand-yard stare”. These are the Veterans who have “seen the elephant”. This phrase comes down to us from the mid-nineteenth century of American history, from those times of the Mexican / American War and the American Civil War. This phrase was used to describe someone who had become a soldier, starting out with great excitement and high hopes, only to be faced with experiencing that nightmare of desolation and sadness; that disenchantment with, and the frustrations, from the destruction of their ideals; that time of going through the horrors of warfare, experienced in the mud and gore, at the ground level. This writer was very fortunate. As a high school senior and in the Army National Guard, I was told that I would be taught to shoot people. I chose instead to enlist in a military service that would teach me to do search and rescue work. I spent my military service doing just that, on the North Atlantic Ocean off the coast of New England and out to one thousand miles. My first human body recovery experience, outside of a funeral chapel, was just three months after my eighteenth birthday. The body was in Portland Harbor and had been in the water for a few weeks. As we worked to recover the body, the flesh fell away from the skeleton back into the water. Welcome to salt water rescue work, kid! This Memorial Day remember that it’s good for us all to remember our military Veterans and what they have done for us, but it’s also good to remember that our military Veterans have their own memories to deal with. A dilemma, do I get out my favorite Sage reel and pole and head straight for my usual secret spot out on the Sebago with my most precious hand tied Magog fly, a sure winner when it comes to catching local spring salmon, or do I take advantage of the early season and go fiddling for a precious spring green in places no one knows about? What a dilemma, fresh salmon or fresh fiddleheads. I know the fish are biting, yet the question remains, can we still find some of the local delicacy the unfurled fiddleheads? Maine has a lot of secrets, one of which is the spring fiddleheads, the unfurled fronds of young ferns that are harvested as a precious spring green. What are fiddleheads you ask? Some people use the unfurled fronds of the lady ferns, the Bracken ferns, and for some the Cinnamon ferns, but the real Maine fiddlehead connoisseur, the real old timers use the fronds of only one, the Ostrich fern. When I first came to Maine some twenty years ago as a flatlander and I first heard about fiddleheads my response was typical, you eat what, yet now looking back I can only say thank you to whoever turned me onto this precious tasty right of spring. Now it wouldn't be spring without the treasure of the fiddleheads. Fiddleheads, the unfurled new leaves still tightly coiled are harvested simply by cutting the tender individual fronds in early spring before they fully uncoil. So as not to damage the individual adult ferns only about three fiddles are harvested from each individual plant. I only take two. It is important not to overdue the slicing because each mature plant only produces seven new fronds each season that ultimately turn into leaves. Over picking will easily kill the plants. Though they are a real Maine thing, eating fiddleheads isn't new. They have been part of the French diet sense the middle ages. More to the point when the first settlers arrived in the new world it was the Native Americans that first introduced the new arrivals too many things, including the bold ostrich fern. Growing wild in deep, rich, aged, wet, organic soils, once found, these treasures of the shade are often held as secrets shared with only a precious few. Cooked typically steamed or boiled before being eaten hot either with a simply dollop of butter, or as I now do with a touch of Parmesan or sometimes a warm coating of hollandaise sauce. For some the slight bitterness can be a turn off, but a great way to compete with the distinctive taste, a cross between fresh spring asparagus and summer green beans is to boil them twice with a change of water between boilings. Removing the water removes the tannins. For most Mainers cooking is simply to lay a fresh washed layer in a steamer and steam just until al dante. Done. Rich in various vitamins and minerals their real gift beyond taste is the high amount of antioxidants and dietary fiber. Like anything else picked, wild fiddleheads should be washed first just to remove any fine soil grains before cooking. Fiddlehead carbonara, oh I can taste it now. A truly versatile green with so many ways to be used. In spring in salads, or maybe as a green in a potato soup, or simply as a green by themselves, don't be afraid to experiment. 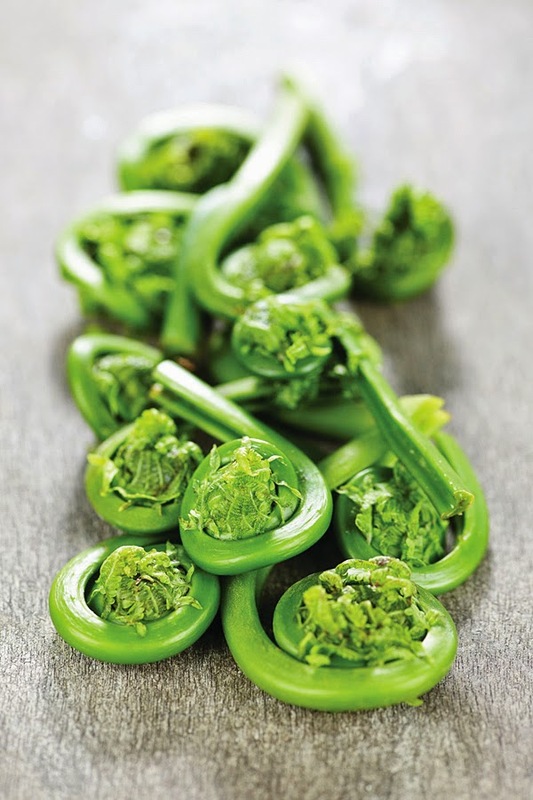 So if you haven't yet tried fiddleheads watch for them in the market this spring and give them a try. Before you know it you may even be pickling some to share with others. I can taste them now. The salmon in the Sebago will just have to wait a bit longer. Artwork by Virginia A. March of Windham will be on exhibit at the Windham Public Library, 217 Windham Center Road, now through July 31st. The nine-year-old artist has been drawing since the age of four and recently had her first art show at the Maine Charitable Mechanic Association Library in Portland. Her dream is to work in fashion or interior design, and she says that "drawing gives me the chance to create fashion, design and have fun." Stop by the library to see the nearly two-dozen pieces which are on display. Visit us online at www.windham.lib.me.us/exhibits for more information or call the library for hours or for directions at 892-1908. 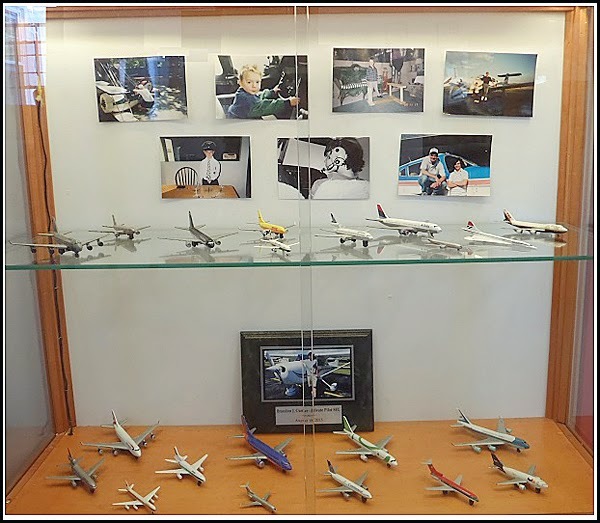 A small fleet of airplane models from the collection of Brandon Currier will be on display through July 31st at the Windham Public Library, 217 Windham Center Road. Since he was very young, Brandon has loved airplanes-- as seen in the photographs that accompany the display. He has always had ambitions to become a pilot, like his father, and last summer his dream became closer when the college-bound young man received his piloting license. The models on display were gifts over the years, and would be of interest to anyone who shares a love of aircrafts. Stop by the library for a look at this fun collection. Visit us online at www.windham.lib.me.us/exhibits for more information, or call the library for hours or for directions at 892-1908. Volunteers are needed. Fufill service hours.